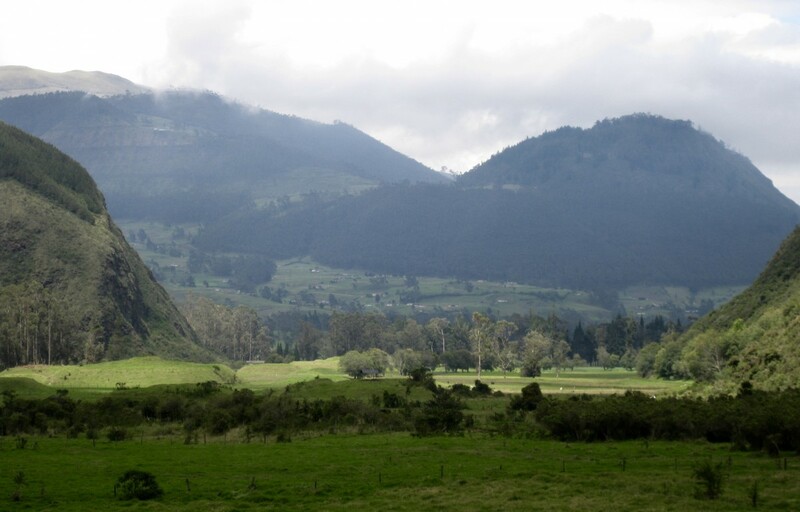 The spectacular mountain setting of the huge ramp mound site at Hacienda Zuleta (www.zuleta.com) in Ecuador’s northern sierra, Imbabura province, was the location for my next experience of traditional healing. 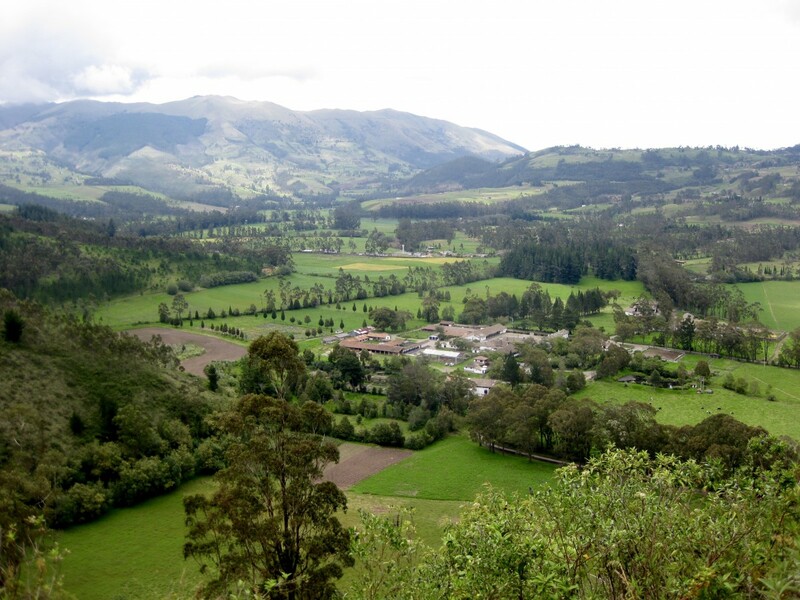 Four ladies from Minnesota who were staying at the hacienda had arranged to have a full diagnosis and healing with the local shaman Giovanni, in the precincts of the large archaeological site. 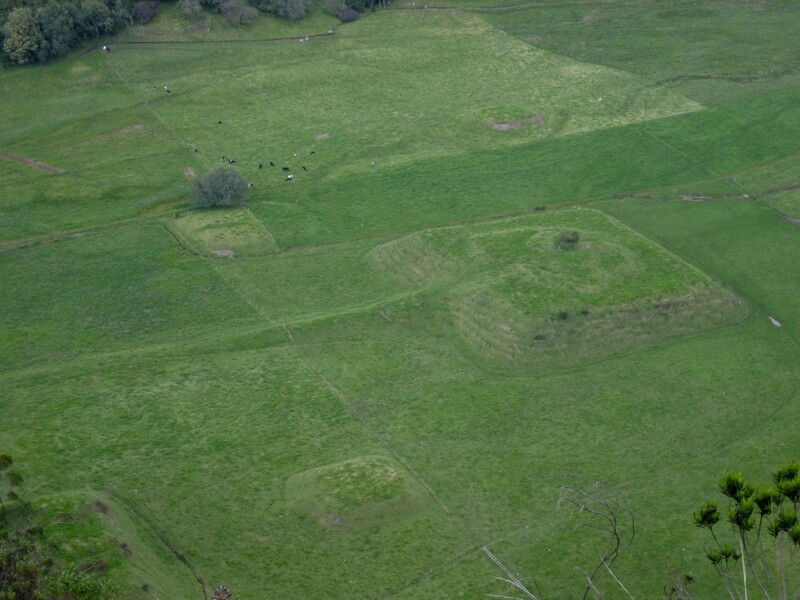 The ramp mound site at Zuleta is one of two best surviving sites of its kind in the northern region of the country, with much of the pre-Colombian occupation focused upon large hemispherical and quadrilateral mounds dating to what is called the Late Period of the Ecuadorian sierra cultural sequence, commencing around 1265 CE. The mounds are distributed along the Quebrada San Pedro in the flat valley bottom land, with tall green mountains rising steeply up on either side to the high paramó, where condors circle in the high cold airs. Here in the pre-Colombian past, the site was the location of one of the region’s paramount chiefdoms, a political and ceremonial focus for the scattered populations of ‘Caranqui country’, until their final defeat by invading Inca armies late in the 15th century saw the site eventually abandoned. In time, after the arrival of the Spanish in the mid 16th century, a livestock ranch – estancia – and then a textile workshop - obraje – were founded close by and little by little the historical hacienda took shape, adding to the long trajectory of human occupation and land use of the region. The hacienda still owns extensive farmlands, forests and herds of cows, sheep and horses, but has now become a country hotel for the many international tourists who visit it throughout the year. What more atmospheric location than this to have a traditional healing? The original plan had been to have the ceremony up on top of the largest ramp mound in Q. San Pedro, but cows from the surrounding pastures, their curiosity tweaked, invaded at the last minute, so we re-located down by the small river that winds its way alongside the mounds. It was cold, overcast and misty, but at least the heavy rains of recent days had abated. The five of us sat down and waited for Giovanni to organise himself. I had no real idea what to expect, guided only by the extensive ethnohistorical research carried out in the last few months and my own personal experiences of the two limpiezas recorded in previous blogs. It was immediately clear that Giovanni’s method was very different from these earlier experiences, but there are no standard ‘protocols’ in the way we expect of conventional western medicine and there are a wide variation of diagnostic methods and therapeutic interventions amongst the many traditional indigenous healers throughout the sierra. Even the philosophical basis for the understanding of the body and illness can be different. At the start, the patient is sat down in front of a charcoal brazier, upon which is thrown handfuls of herbs, sending plumes of aromatic smoke into the air, which is then wafted onto the subject using several large black condor wing feathers. This is followed by a light beating with a bunch of magical herbs, and - perhaps bizarrely to the eye of an uninitiated observer - Giovanni smokes a large cigar throughout the diagnostic and therapeutic stages, periodically directly blowing smoke upon his patient, which all serves in the process of ‘opening up’ the body’s energy channels to be ‘read’ by the shaman. Giovanni told me that he is able to ‘visualize’ the body’s energy imbalances, which give rise to illness, by this divinatory process. This is, in fact, commonly reported by skilled indigenous specialists since the earliest colonial periods, wherein judicial records from the ecclesiastical trials of persecution of indigenous religion contain accounts by the accused of the methods they employed for divining illness and then curing it. Skilled specialists describe the ability to see the nature of afflictions, as clearly as if in a mirror, or as if the body were open to the eye. No less Giovanni today. Yet the conceptual framework he uses is far closer to Eastern Asian yoga understandings of the ‘subtle’ system of the body with its principal energy channels – the nadi - of right, left and centre, with the seven main chacras as nodal or energy points through which the prana or life force moves. The concept of prana as life force is itself very close to the Andean concept of camay – the vivifying energy that gives being to and animates all things. With his patient now ‘open’ to his inward sight, Giovanni moves to the body regions where he perceives there to be energy imbalances, and subtly manipulates them, both through the firm bodily placement of his hands, and through the subtle manipulation of energy with his hands held at a distance of some 10cm away from the body. To observe this you really feel that he manipulating and rebalancing invisible bodily energy vortices. He worked upon different parts of each of his subjects, which I was told corresponded to different regions where they had experienced different health problems – one digestive, one ambulant, one head and neck, although he had no prior knowledge of this. At the conclusion of the therapeutic process, he then re-closes the body and ‘seals’ it, to protect it from ‘infection’ by exogenous negative influences. Herbs are once again beaten lightly over the body; a compound of aguardiente infused with herbs is sprayed front and back over the subject, then tobacco smoke blown front and back, upward along the body channels, enveloping the subject in an aura of pungent smoke. Finally, more herbs are thrown upon the fire and the smoke wafted over the subject. He then summons the powers of the four cardinal directions, and the sky above with the condor feathers, bringing them into his patient. The therapy is complete. He kneels and quietly whispers to his patient that she may leave when she feels ready. Whilst many indigenous healers conceptualise illness as being the influence of mal (evil) or susto (fright illness ie shock), Giovanni does not. He says there is one energy which is neither good nor evil, but that imbalances of it in the body are the underlying causes of the illness that people experience. His work is to identify where these imbalances are and to restore the natural bodily equilibrium. However, as with any treatment, if the patient is not prepared to address the underlying reasons for their illness and to change their lives accordingly, then, little by little, the energy will once again become imbalanced and illness follow. By the time we all left the valley dusk was starting to fall, and the looming presence of the great deserted mounds, with the dark mountains climbing steeply on every side felt strange and otherworldly. We drove back along the farm track to the warm brightness of the hacienda and I left soon afterwards to return to Quito. Giovanni’s patients seemed very happy with their unique opportunity to experience traditional Andean healing in such a beautiful and evocative location. This blog entry was posted on Friday 3rd March 2017.